Yes, I made it back to the front of the plane. Look, it’s been a year, okay? 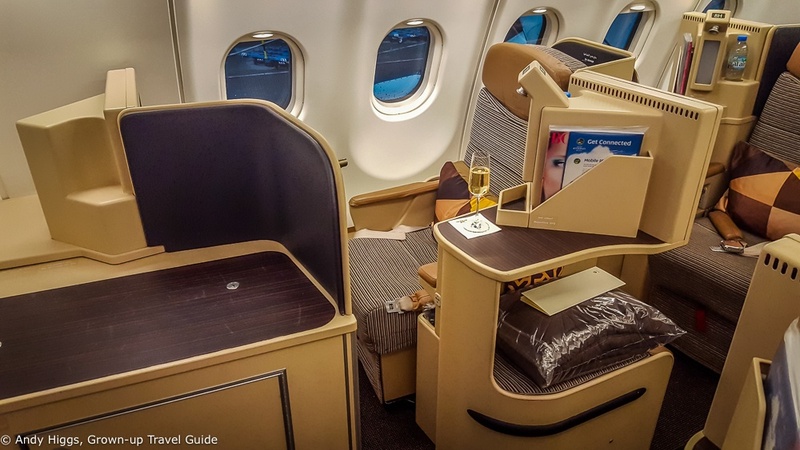 My last splurge was in April 2015, when I blew the last of my United miles on a combination of Lufthansa and South African Airways flights in Business Class. 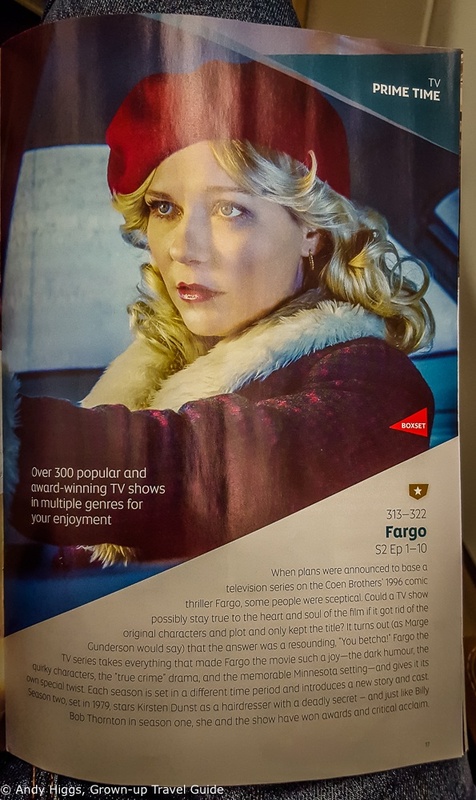 I was then consigned to the wilderness (well, Economy Class) for almost exactly 12 months, including a couple of long-haul trips – on KLM to Osaka and later to Miami. I had no complaints; Economy was more comfortable than I remembered, even when spending an entire working day up in the air. 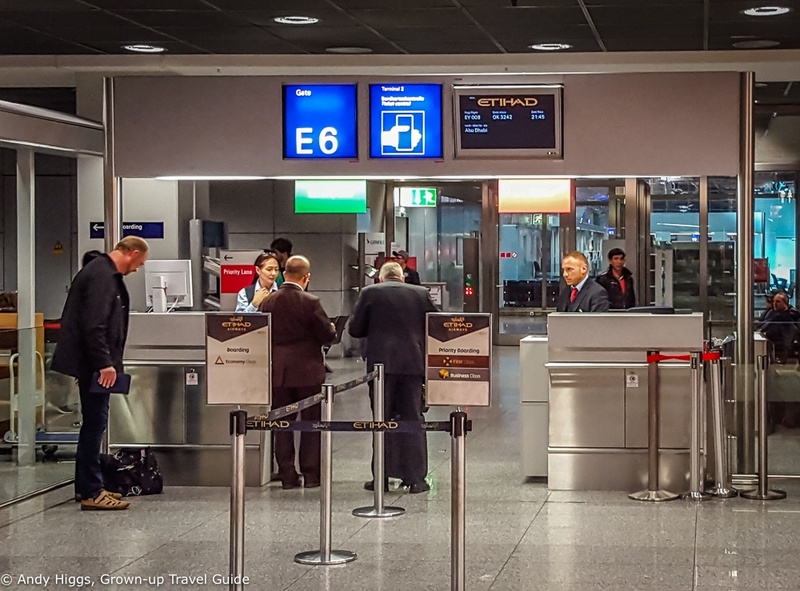 But when the time came to plan my next trip to Cape Town, South Africa I decided to use my stash of American AAdvantage points and try a different airline at the same time – Etihad. I was also able to include a domestic return flight from Cape Town to Johannesburg on the same ticket, which would be with Comair, a subsidiary of British Airways in South Africa. There was a slight complication and extra cost involved though. Etihad has no alliance partners within Norway so my first flight would not be included in the award redemption. I thus used SAS EuroBonus points to start and finish my journey; securing a seat from Trondheim to Copenhagen and then to Frankfurt, returning on the same route but with an additional change at Oslo. As a Silver EuroBonus member I could take advantage of an extra piece of checked luggage (which is standard in Business Class) so there would be no extra charge for Dennis the Drone. 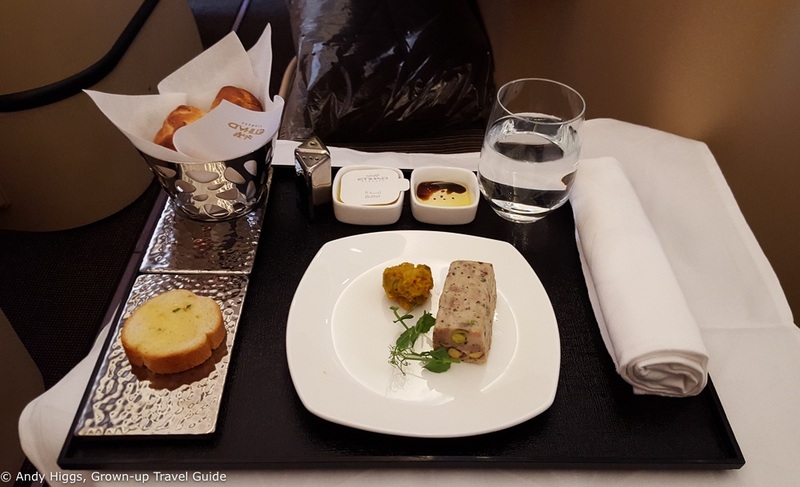 This report covers the four flights I took with Etihad; the experience was basically the same each time with minor variations in food and drink and the plane configuration – I’ve pointed out any differences and unique aspects of the individual sections. These flights made up the longest section of my journey to Cape Town; the entire routing using two award redemptions was as follows: (SAS EuroBonus points) Trondheim – Copenhagen – Frankfurt – (American AAdvantage miles) Frankfurt – Abu Dhabi – Johannesburg – Cape Town – Johannesburg – Abu Dhabi – Frankfurt (SAS EuroBonus points) Frankfurt – Copenhagen – Oslo – Trondheim. There’s no time difference between Norway and South Africa at this time of the year and jet lag is never an issue. It’s still a long journey, though, so a lie-flat bed is a great way to get there a little more refreshed. On the other hand, next time I’d rather choose a more direct routing and endure 11 hours in Economy than a total journey time of over 35 hours in Business Class – each way. The things I do to write reviews for my readers, eh? Once again every one of those points was purchased during a special offer – I did not earn them by flying. You’ll find more on this strategy in our guide to playing the frequent flyer game here. With miles bought at 50% discount and taxes and other costs amounting to USD 282.80, the total cost for my trip (150,000 points) was around USD 1700 – quite a bargain compared to the astronomical cash price. Frankfurt airport is a bit of a nightmare, it has to be said. It’s huge, badly signposted and seems to have been designed to frustrate passengers changing planes as some kind of wry German joke. Basically, you need at least an hour if you are switching form short to long-haul (i.e. from one terminal to the other). I had two hours and for some reason was confident that this would leave me enough time to enjoy a beer or three in the Etihad lounge. I forgot that because I would be changing airlines I would have to pick up my baggage and check in again. My luggage arrived promptly enough and I even had a 1 Euro coin to get a trolley. The charge is non-refundable, but you can pay by credit card if you have no coins. Then my problems started. I cleared customs and then went looking for the Etihad check-in desk, only to find that it was in the other terminal which is a train ride away. And you can’t take trolleys on the train. Luckily an American guy who was inexplicably working at Frankfurt airport skilfully read my “Oh you have to be *****ing me” expression. Hetold me to stay on the train to the last stop (everyone else got out at the one before, as I would have done if he hadn’t told me) as there were free trolleys there. It proved to be a great tip. I loaded my bags and made for the lift. The lift wasn’t working, but at Frankfurt airport it is quite normal to put trolleys on escalators, so I did that. I managed to hold mine stable at 45 degrees and made it down to the first floor. I then rushed to the Etihad desk only to be mildly scolded by the agent for not getting their earlier (an hour before departure was expected). However when she saw I was flying Business Class she changed her tune as those in the expensive seats get an extra 15 minutes. In any case the plane was now boarding (I had about 50 minutes before take-off) so I had to get myself through security and to the gate. It certainly looked inviting and at this point I could have used a shower after racing through the airport, but there you go. I took advantage of the priority boarding queue to go straight on board and find my place. I had checked in online the day before and managed to grab a “proper” window seat (7K) at the very front of the Business Class section. The seats at the side of the plane are staggered so every other one is actually some distance from the window, as you can just about see from the photo here. 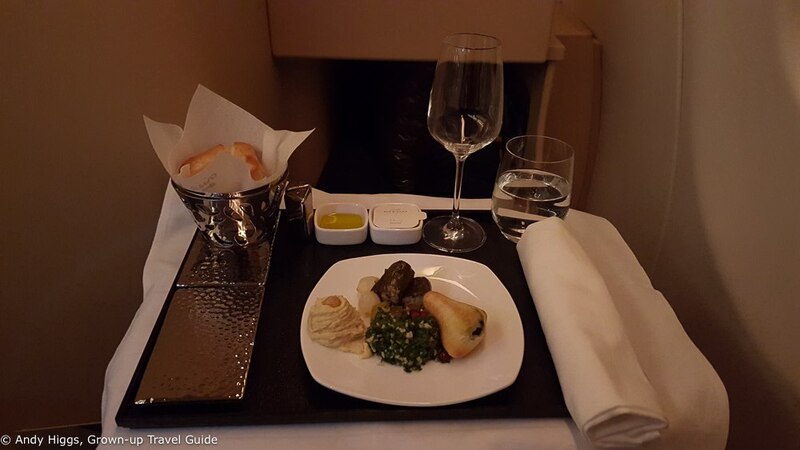 I liked the decor and the seat was comfortable but there were a couple of niggles – as may be expected as this is not the newest version of Etihad Business Class. My first issue was with the relative lack of storage space. 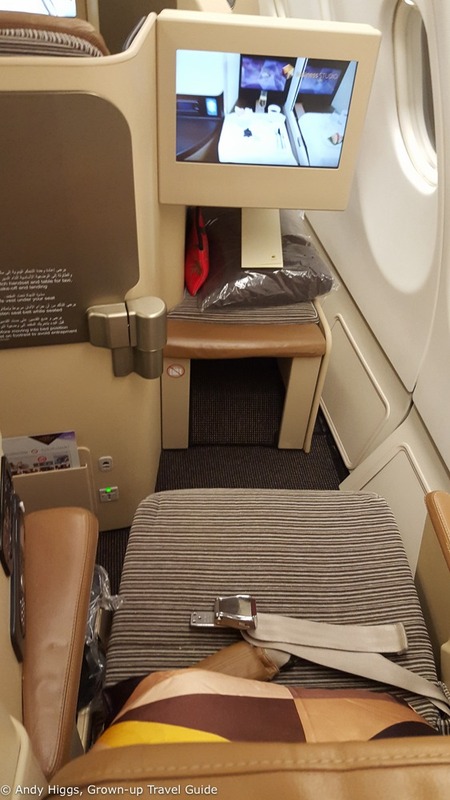 There was an overhead locker but little space in the seat area itself; if Business Class is full and everyone had as much hand luggage as I did there would be problems – there is no overhead luggage space above the aisle seats. The other problem was the size of the seat. I found it rather narrow but worst of all was the fact that even fully reclined it was only 6 foot 1 inch – being 6 foot 3 it was a bit tight. Otherwise all was well – and I sleep on my side anyway, so as long as I didn’t have my legs fully stretched out I would be fine. 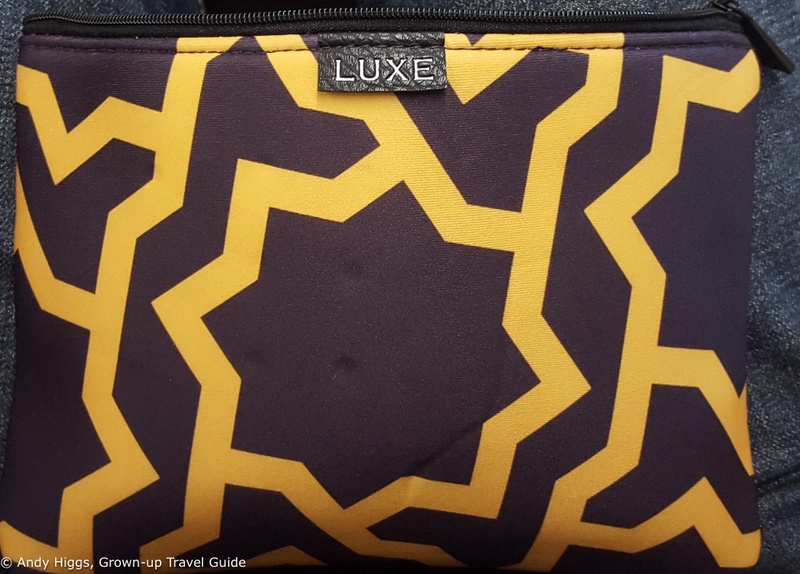 The amenity kit was pretty standard but rather pretty, containing eye shades, socks, a toothbrush and toothpaste, hand cream, ear plugs and headphone covers. A pillow and soft, thick duvet/blanket were provided too, as well as good quality noise-cancelling headphones. Each seat has its own 15 inch LCD monitor, operated via a wired handset or by using the touch screen functionality. The selection of films and TV series was pretty good, I found plenty to keep me occupied. The real-time footage from the aircraft-mounted cameras and interactive maps are also good ways to pass the time. The seats have AC and USB outlets for powering up devices and of course a tray table. A quick tip – use AC if you can, it will charge your phone about a thousand times faster than via the USB socket. I was offered a hot towel and pre-departure drink. You can’t really go wrong with Champagne on such occasions, now can you? Wow. 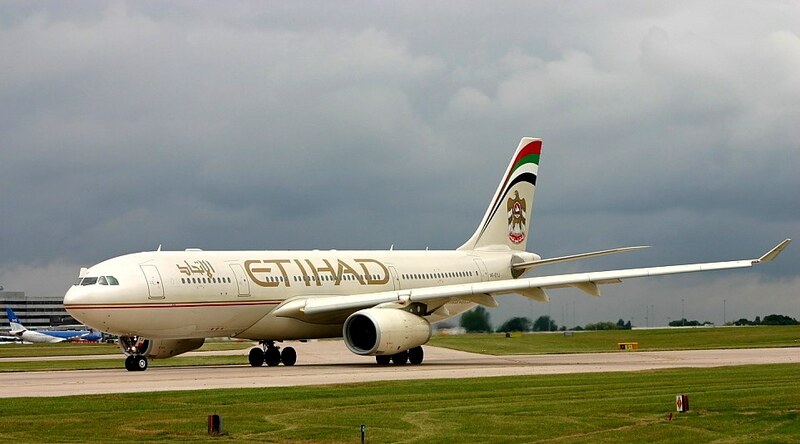 Etihad does a fantastic job here. 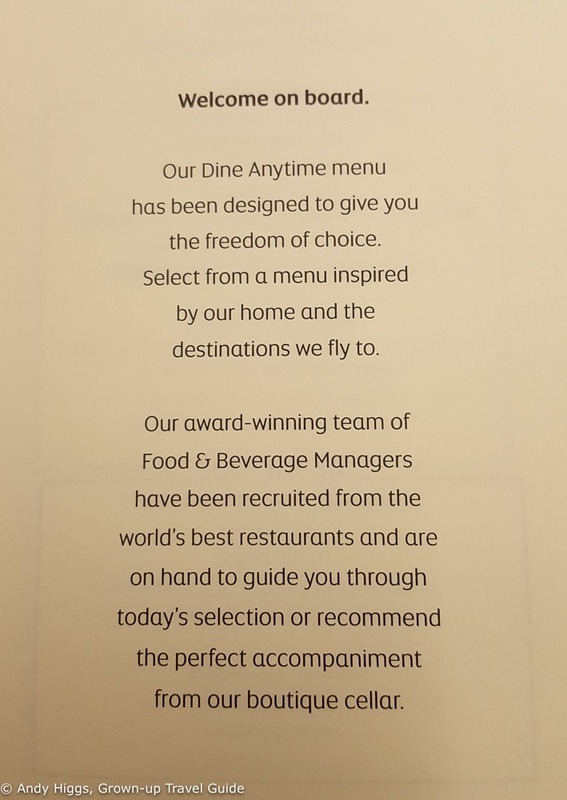 First of all, you can choose from the menu for your main meal and decide whether you would like it served after take-off or later during the flight. With one exception – there is a lack of great beer. 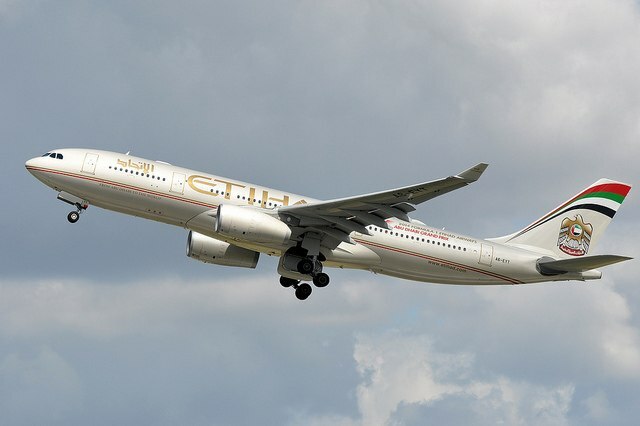 Etihad should consider adding a couple of craft classics to really stand out from the crowd. Where the airline does stand out is in terms of coffee – each plane has a proper cappuccino machine. The Arabic mezze was absolutely delicious. 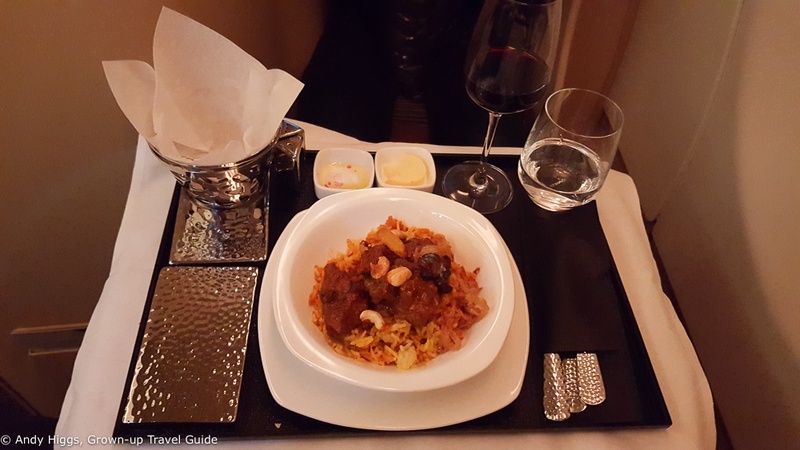 But the main course raised the bar even higher – this biryani was hands-down the tastiest meal I’ve had at 30,000 feet. 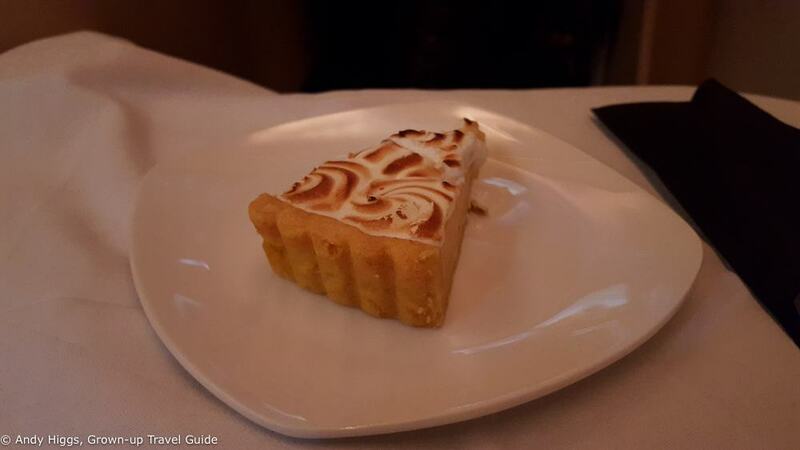 A lemon meringue torte with a cappuccino to finish – oh yes. On the second flight I had the chicken, duck and pistachio terrine. Scrumptious. I followed up with the wonderfully tender beef fillet. Just perfect. We took off on time and service was excellent. Each landing was smooth as silk (a good achievement for an A330) and I found the seat very comfortable if a little small. The cabin crew were attentive, efficient and friendly; never shy to ask if my wine needed topping up. I slept for a few hours on each flight, which was a pleasant surprise and is, after all, what Business Class is all about. 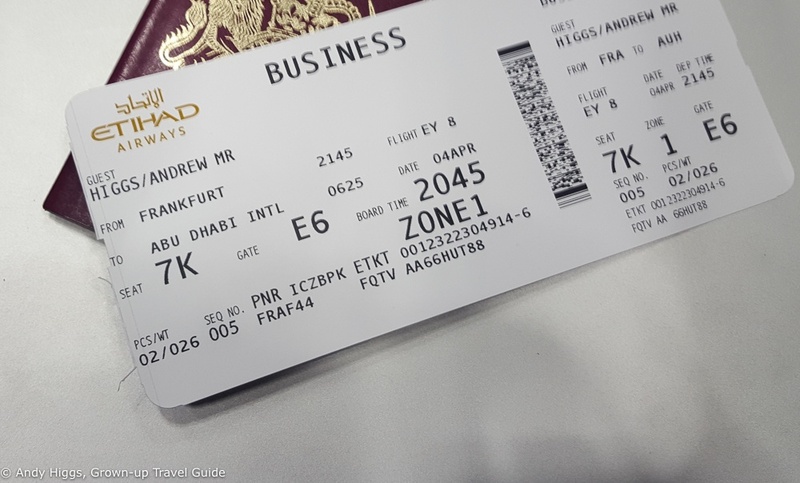 I had just over three hours to wait in Abu Dhabi before the flight on to Johannesburg. 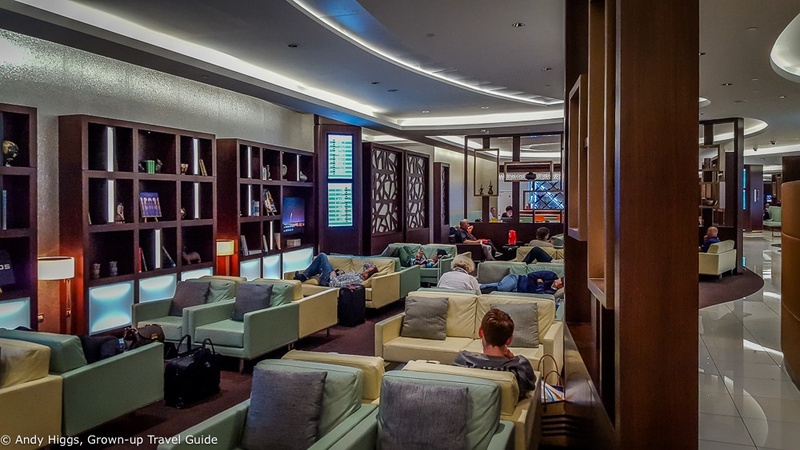 With only ten minutes walk separating arrivals from my gate and the Premium Lounge a few metres from passport control where I emerged from the Frankfurt leg, I was able to spend almost the entire time relaxing. 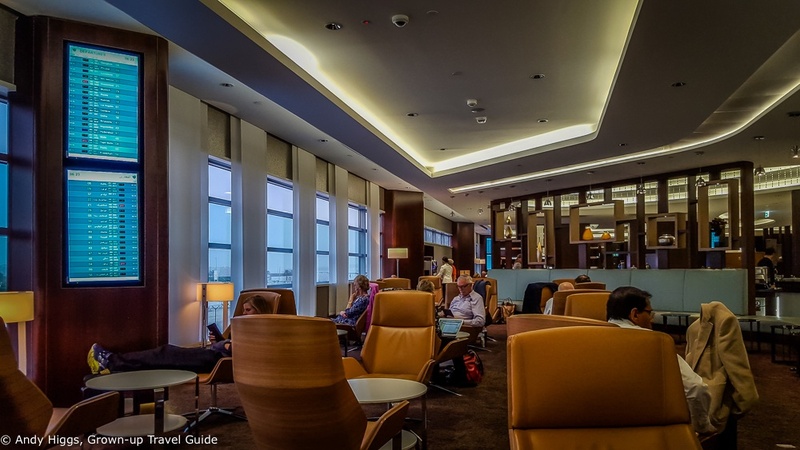 On my return flight I had to change terminals but the Lounges are very similar – for the record I used the one in Terminal 1 on the outbound and Terminal 3 on the inbound. The lounge in Terminal 3 is bigger but otherwise facilities are the same. Interestingly the Premium Lounges are for both Business and First Class passengers – although an exclusive First Class lounge is being built. 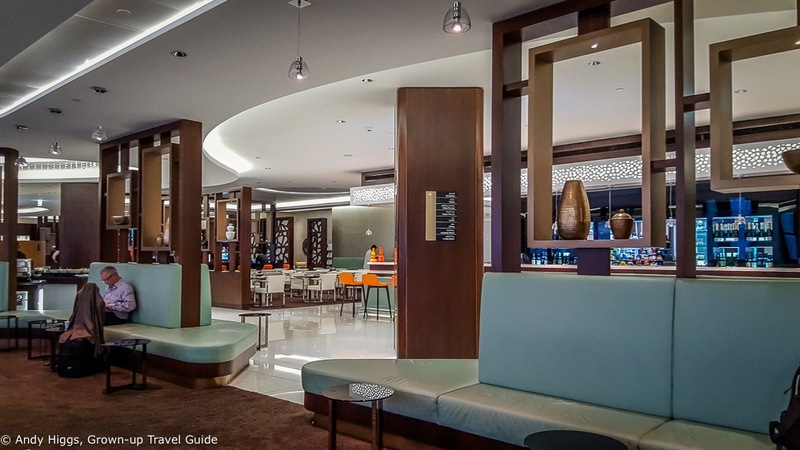 As you will see, these are large, stylish and well equipped places to kick back and take it easy. There are power sockets everywhere and plenty of comfortable seating. You can keep an eye on your flight details on the monitors, too. But for me, the best thing about a lounge is if it has a shower. 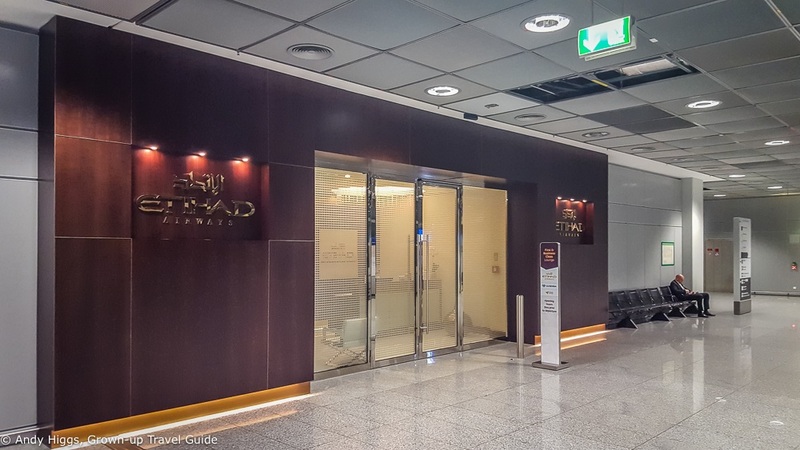 Etihad offer more than that, though – they have a Six Senses Spa in each lounge in Abu Dhabi. You can get a free 15 minute mini-massage, too – my advice is to head straight for the spa and book an appointment as these are popular. 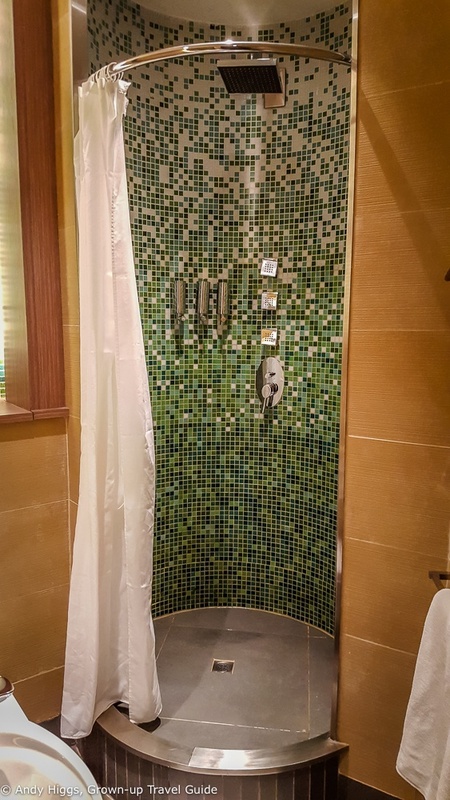 There are showers in the spa and in the main lounge, but the ones in the spa are less likely to be occupied – and if they are, you get a buzzer to take with you which sounds when they are free. Towels, soap, shampoo and conditioner are all provided and the facilities are spotless. Just remember to pack a change of clothes in your hand luggage. 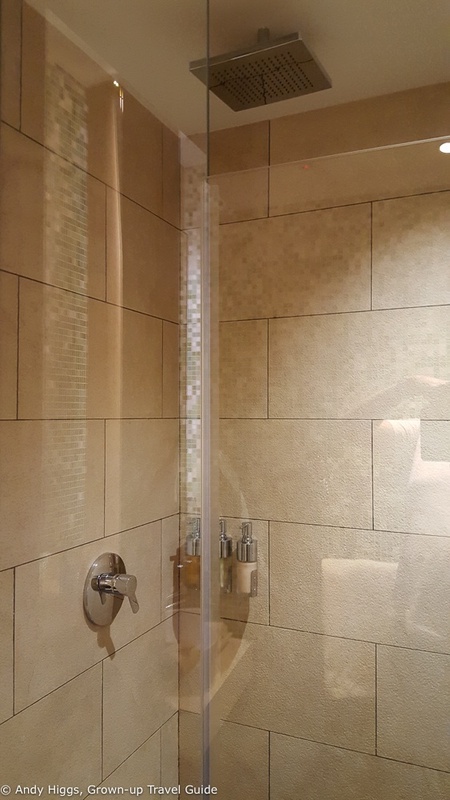 This was the shower in the second lounge. Not much different – and just as luxurious. 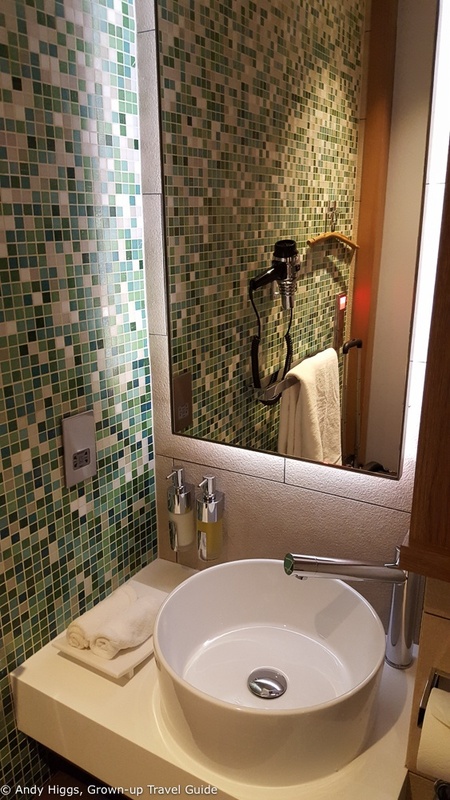 As well the spa and showers, the lounge offers excellent and complimentary food and drink, with a full separate bar and both hot and cold dishes. It’s worth noting that even if you are travelling in Economy you can buy access to these lounges and the fee is reasonable. On my way back I had an hour or so to kill at Johannesburg airport. Here Etihad does not have its own lounge but you can access two shared ones run by Menzies – Mashonzha and Shongololo. They are very popular and not of the same standard as Etihad’s in Abu Dhabi, but still better than waiting in the public area for your plane. Of the two, Shongololo (pictured above) is both bigger and the nicest – but is harder to find. 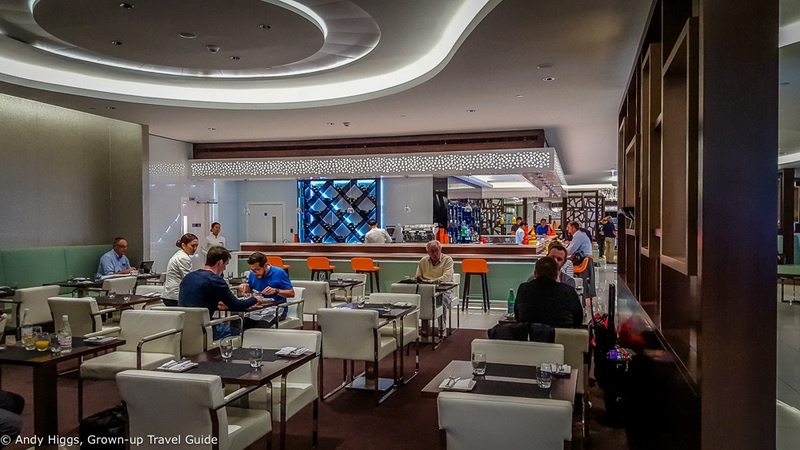 You need to follow the signs for gates A7-A18, pass the Air France lounge and go down the escalator. The lounge will be on your left. 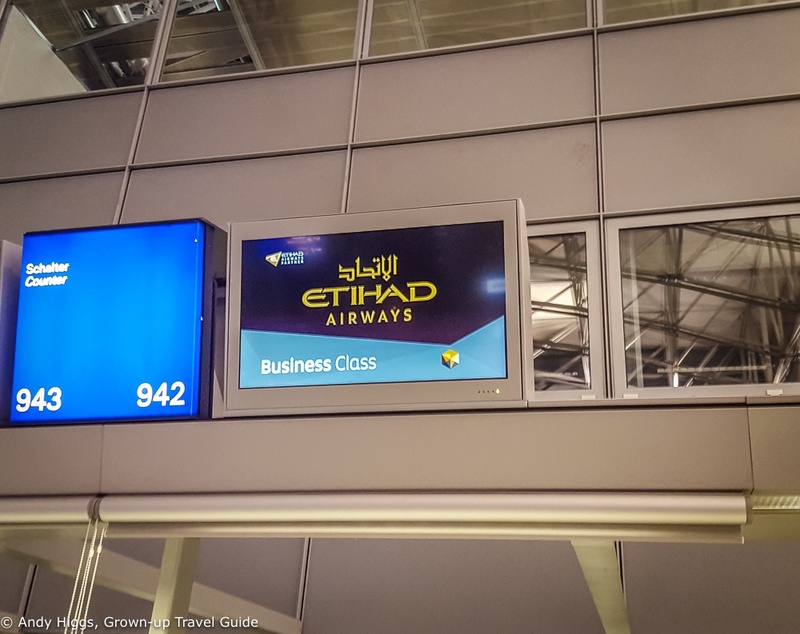 This was a fabulous experience – even if the A330 is not exactly state of the art and Etihad has better Business Class products these days. As mentioned in the introduction this was an extremely long way to reach South Africa from Norway but the luxurious treatment I received made it worthwhile. 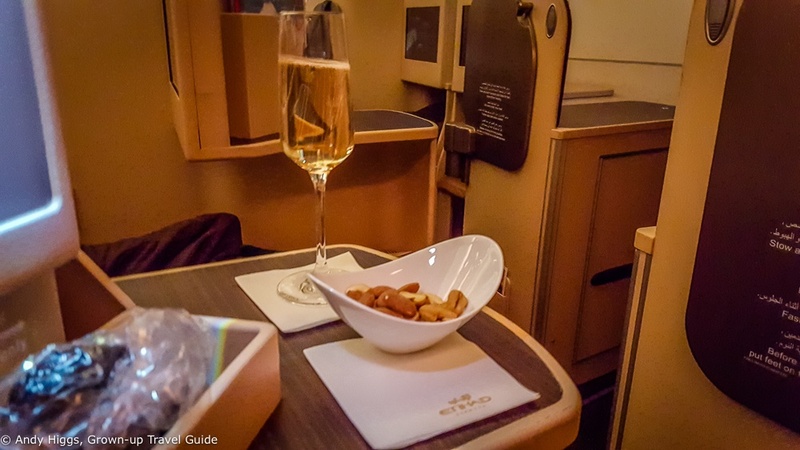 Flying Etihad Business Class is an excellent use of American AAdvantage points. 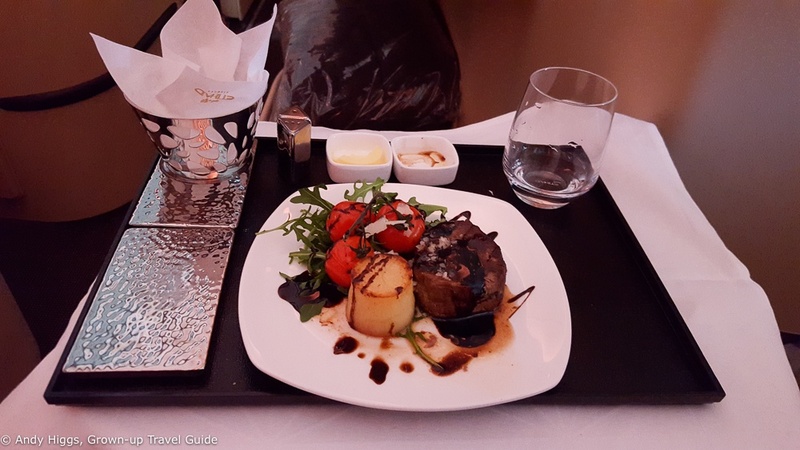 Even after the recent devaluation there are few better ways to use them – and I would highly recommend you consider travelling in real comfort when you are travelling long haul. I hope I’d be able to afford this kind of perks when travelling in the near future. Love your blog, the design. Bookmarked and hope to be back.